Probably a speed hump or a large rock did the damage. 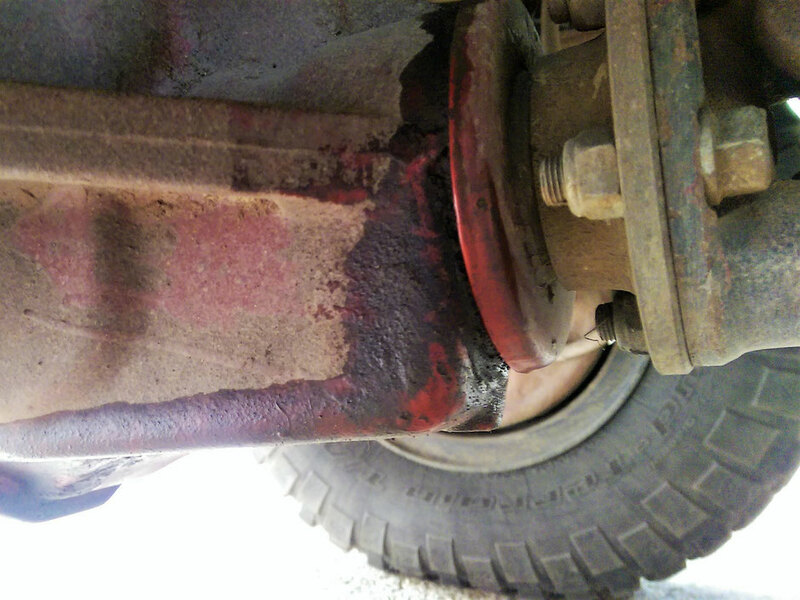 A leaking seal between the differential and rear cardan shaft. Hopefully nothing more serious. The differential casing seemed to be intact. Fortunatly I had in my spares box a new diff seal. Abeba, the manager of ETT in Mekele had spoken to her mechanic so that he knew what the problem was and that we would be coming to him this morning. We were told that the job wouldn’t take that long because we had the spare part needed (thanks again to Carsten and Christian, my mechanics back home) and that it wouldn’t therefore be too expensive (we weren’t quoted though). She had even organized someone (Sisal) who would show us the way there. Manuel had also had a word with them and had put in a good word or two for us. I then explained to Abeba again and to Sisal what was to be done, just in case, and that we would also have an oil change. Reassured that everything was “no problem” we then drove with Sisal to the workshop just a few miles away. Upon arrival we were greeted heartedly by the boss and ushered to the back of the yard. Sisal spoke to him, presumingly about the oil change and we were told to let the engine run to warm the oil. Sisal had perhaps not only been charged with showing us the way, but to act as an intermediate. His English was very bad but better than my ethiopian. The mechanic spoke not a word of english and so we were obliged to have him stay. The mechanic was informed and three boys lay beneath the van as we spoke and began taking the cardan shaft bolts off. I managed to stay calm a while, however the sight of them slipping over the nuts and bolts because they hadn’t the correct spanners was too much and not to be endured. I ordered the boys to get out and told Sisal that I didn’t want to see any children near the van again, that he was to make it clear to the mechanic and that if they hadn’t got the right spanners, they could have mine. That seemed to do the trick. The boss came and had a look himself and thereafter an older boy was assigned to us and given my spanners. Once the cardan shaft was off they couldn’t get at the axle nut and so decided to put it back on, and change the oil first so that I could drive over the road where the neighbour had a pit. In the pit they had room and the shaft and axle nut were soon off again and the seal at last exposed. I then felt my heart drop as I was asked if I was sure that the new seal would fit as it had a different number to the old one. What was to be done? Decision time ! Either refit the old seal and live with the leak and make sure that the axle oil level remained ok until a part could be gotten or until we were back home. Or take out the old seal and trust Carsten and Christian. The old seal couldn’t be gotten out without destroying it and if the new seal didn’t fit then ordering a new one would take weeks and we wouldn’t be able to drive at all. The old seal was chisled out, the new greased and tapped into place and ….. thank heavans (and Carsten and Christian) it fitted !!! The whole affair costed us half a day and 1670 Birr including 6 liters oil. We rounded up to 1800 Birr (56,25 EUR) and the mechanic was very happy. Abeba wanted nothing and Sisal, with whom we spent the afternoon looking for a spare oil filter in vain, wanted nothing either. We had had it replaced using my spare one as the oil was changed. We gave him 300 Birr, nonetheless and he too was happy. So were we, for now we could head for Lalibela, our next destination.